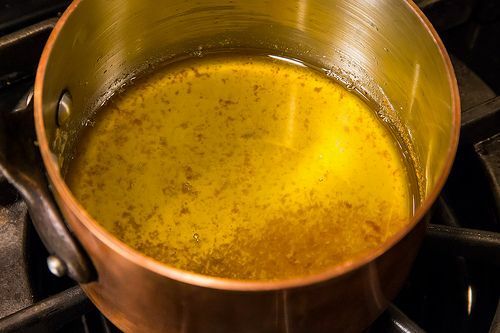 Today: See how simple it is to make your own clarified butter (and ghee), in step-by-step photos. 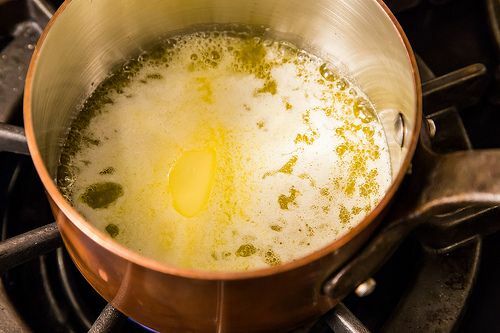 If you want to sear a steak or roast potatoes in something that tastes wholesome and good (like butter) and won't smoke or burn (like vegetable oil), clarified butter is your happy medium. 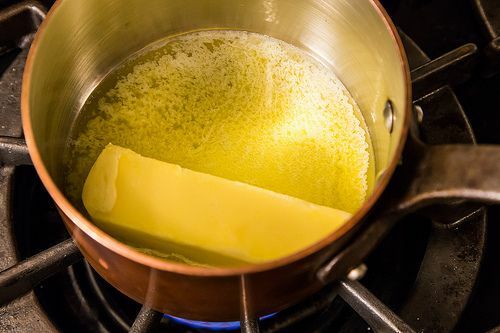 Melt your butter over low-ish heat, without stirring. See those milky solids foaming to the top? Those are what will smoke and burn around 250°F. They've gotta go. 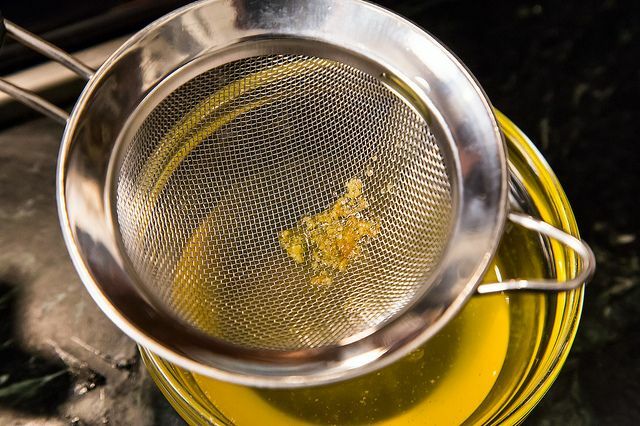 You can use a fine-mesh strainer -- or even a coffee filter -- to catch the bits. The more of those milk solids you strain out, the longer it will keep. So if you're making a big amount to store, you may want to rig up an extra layer to strain through (using that coffee filter, or adding cheesecloth to your strainer). For most uses, just a simple strain like in our photos will do the trick. Either way you remove the milk solids, don't let them go to waste! Spoon them onto bread or biscuits, or add them to your baking -- Food52er Panfusine recommends stirring the browned bits into rice. Here it is -- your golden ticket to smoke-free sautéing, searing, roasting, and frying (up to 485°F!). It will keep for months in the refrigerator or freezer. Now go make the world's crispiest potatoes to reap your reward. Will the clarified butter gel back up if refrigerated ? 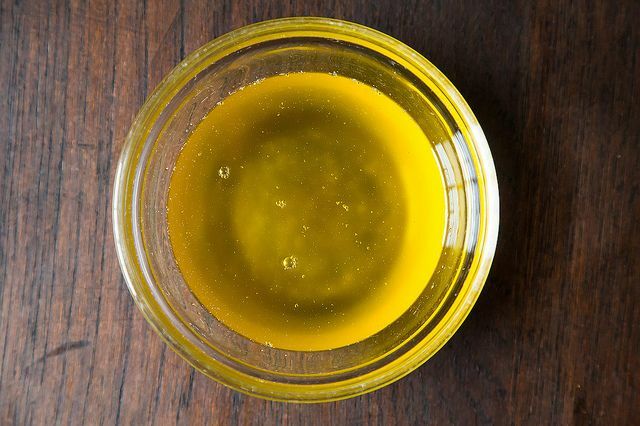 Ghee is not healthier than butter. It's butter minus the milk solids and the water. for a given measure, it has a few more calories. 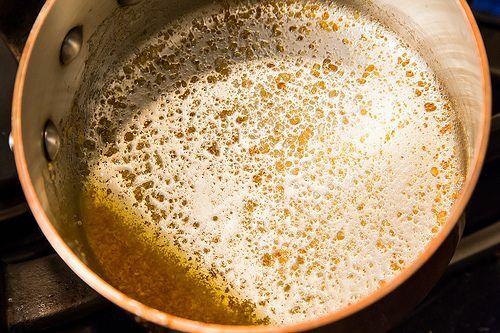 If I use salted butter, will the salt stay with the water, making unsalted clarified butter? 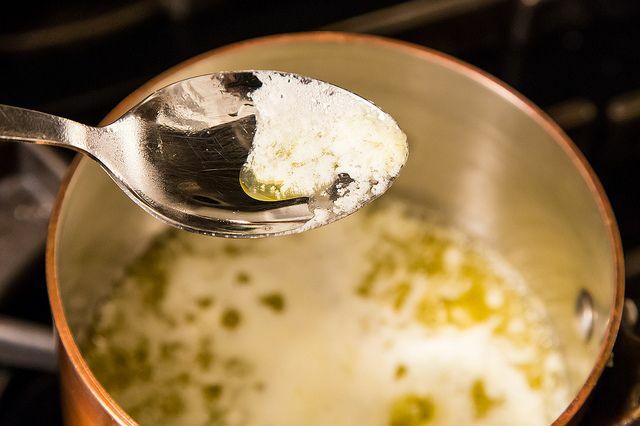 If you use salted butter, your ghee will be salted as well. Its best to go the 'unsalted' route so then you can control the amount of salt with your other ingredients if you are worried about salt content. I just made ghee for the first time last night, and it's so much easier than I expected. The solids, sadly, were discarded since they are the very part of butter that makes my immune system revolt in the form of itchy patches. I mourn that loss! Great point for those who are lactose intolerant. At least the ghee itself is pretty wonderful too! This is exactly how my Indian mom does it! 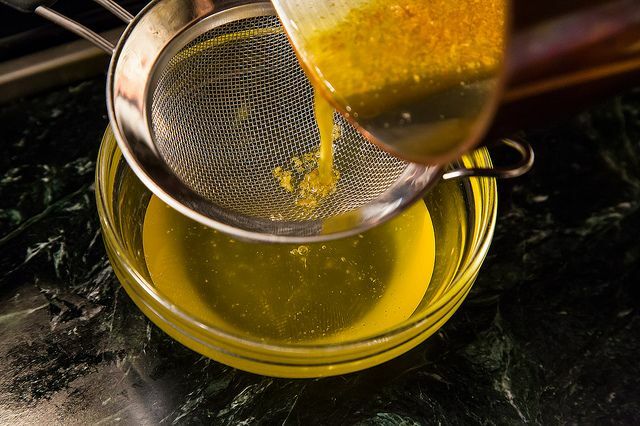 Another tip, pour the ghee in an air tight container and store it in the fridge for longer shelf life. Just take scoop out what you need and melt it over the stove or in a microwave to bring it back to liquid form. Such a great thing to have in the fridge at all times. I stirred those browned bits into a bowl of mashed potatoes after making ghee on Sunday evening. They were delicious! mashed potatoes sounds like a great idea Cookie, love it! I only learnt about saving the brown bits recently - they are divine in a crepe. Most times, I clarify my butter on the stove top, and occasionally I'll put it the microwave to make beurre noisette - the browner, nuttier version. Never thought to do it in the microwave, KB. What sort of vessel and cover do you use? This calls for a big squeeeeeee! 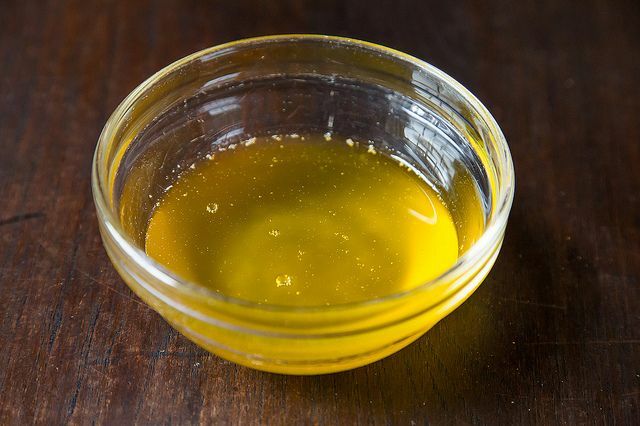 Being an Indian myself, I never realized that I could make my own ghee at home (and it looks just like the fresh ghee from my grandfather's farm!). Frankly, I didn't realize that it was so easy either! I mean, this could save me a good amount of money from all the times we buy jars of ghee (which can who-knows-what kind of preservatives). I don't think you are going to save much by making your own ghee, although I haven't penciled it out. Methinks you are going to take satisfaction in knowing exactly what's going into your system; allowing for your own salt levels and flavoring, etc. if it's economizing you are interested in I would suggest looking for bargains in "nearly expired" cream. Make your own butter (salt free of course) and go on from there.